As amusing it is to have a bird flying here and there inside your house, the bird is probably really frightened about the whole ordeal. It can enter the living room or even the basement on a lucky day, then desperately trying to escape. City birds like sparrows and starlings seek the protection from the cold outside and the warmth from your house will usually attract them. They may fly through an open window or down a chimney, then proceed to the water heater or furnace in the basement. How to get a bird out of your house? Keep in mind that the bird is more afraid of you than you are of it, remain calm and learn the following methods to deal with the situation. Get all the doors and window open. This will allow the bird to find its way out easier, better chance at it anyway. All that is left to do is sit down and relax. Make some tea or read a book. The less movement you make, the more at ease the bird will be. While it is frantically flying around, the bird might hopefully fly out on of the outlets. If after half an hour with no result (or worse, more birds join the fray), rolled up a newspaper or a broomstick to lightly nudge the bird and direct it out of the open window. If this doesn’t work either, catching one will be your next option. When the bird feels trapped and going on full panic mode, frantically flying around to find its way out, it will eventually tire itself out. The bird will then find a comfortable place to perch on, and this is the time for you to strike. Grab a plastic bag or a large fish net and ease it on the ground where the bird might stand, lift it to catch it. This will do less potential harm than trying to swap it from the top or side. You could also use a towel instead. Spread it opens and throw it to cover the bird. Once captured, grab the ends into a hammock and carry the bird outside to release. How to get a bird out of your house? If you are having trouble with the situation, call a professional. Wildlife Removal Company or often pest control could help you to get a bird out of your house without harming it. If you aren’t sure of who to call, try the local veterinarian, animal control office or the humane society for advice. Having a bird perching on your fireplace or chimney can be pretty frustrating to deal with since the wandering fowl might find itself stuck inside the chimney, then unable to fly its way out. Sure you can just light the fireplace up and hope the smoke will choke the bird, knocking it out and have it land right where you can reach it. But in all honesty, you will rather not harm the bird at all. This method will take some time but it's the best one to help it escape out to the safety of the outdoors once again. Try to locate the bird inside the fireplace. You might need to open the fireplace damper if it is in the chimney. Place the large box with its side up inside the base of the fireplace. You can prop the box on another box as necessary to cover the entry to the fireplace. This is to prevent the bird from flying into your house later. Leave an inch or so of the opening from the top. Turn the flashlight on and insert it in the box. If you can, have it facing up the chimney. This attracts the attention of the bird. Turn off any external noise around your room (TV, radio, etc.) and be quiet. Wait for the bird to enter the box. Slide in the cardboard sheet through the one-inch opening to trap the bird inside. Take the box outside and set it free. If the bird is perched on the fireplace, limit its escape route by closing all the windows and doors leading to the room. Entryways can be covered with sheets. Hold them in place with the thumbtacks. If the bird finds its way into the room, open the window and dim the lights. Wait for the bird to fly out on its own or prompt it gently with your broom. You might want to turn on the exterior lights to help the bird pinpoint where it's supposed to be heading. 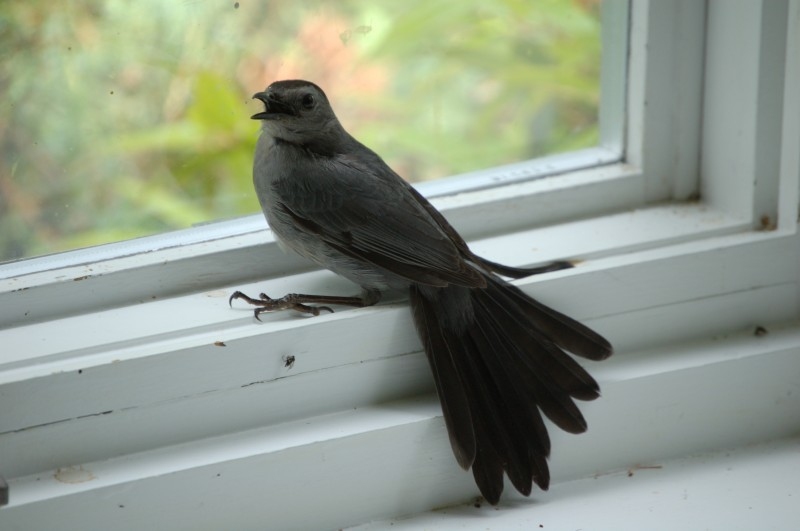 If your fireplace has a door or screen, slowly open it up and toss a spread out the towel to capture the bird. Grab the ends to form a hammock to safely transfer the bird outside before releasing it. Server responsed at: 04/26/2019 4 a.m.